Can you smell that? It's fresh air! How exciting! We can finally get out and about. Although, my little Darcy is not such a good napper, so my trips out and about are pretty limited these days. I've done lots of cooking this week, since I got my August issue of Rachael Ray's magazine. My favorite meals for weeknights come out of her Weekly Menu Planner and now they've made it even easier by emailing the recipes each week. You can sign up for the email here. These recipes are usually short on ingredients and time, which is exactly what I'm looking for these days! Nellbe at Nellbe's Scribblings tried several Rachael Ray recipes lately, including Salsa Stoup and Double-Decker Baked Quesadillas. Michele at My Italian Grandmother was inspired by Rachael's recipe for Migas to use up some leftovers. Celebrity Baby Blog tells us what Rachael said about having kids in the August issue of Ladies Home Journal. They Call Me Red features a recipe for Skirt Steak with Deconstructed Guacamole from Every Day with Rachael Ray. Tracey at Foodie Obsessed highlights a recent segment from Rachael Ray's talk show about purchasing produce. Karen at Busy Mamas made Cheeseburger Meatloaf with Mashed Potatoes. Melissa at Made by Melissa tried a recipe that I think might make it onto our menu one of these days -Two Sauce Weeknight Lasagna Bowls. 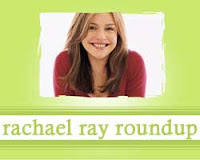 Cate at Kids Cuisine shares a review of Rachael Ray's new cookbook for kids. PatsyK of Family, Friends and Food gave Rachael Ray's new cookbook, Yum-o! The Family Cookbook, a test drive. It's so sad to hear she doesn't think she has time for children of her own. I admire her for recognizing her lack of time. It'd be worse to have children and not be able to raise them. Thanks for the link! I haven't got my August issuse yet so that makes me a bit sad. Have you had it long? Not too long - maybe 3 or 4 days?